The cultural revolution in China was one of the most disastrous events in terms of loss of human life in history, which also saw the destruction of 5000 years of cultural heritage. 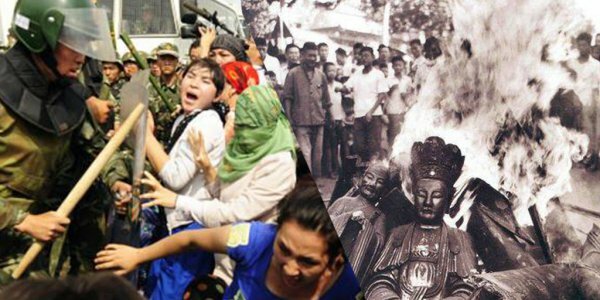 Recently, the Chinese Communist Party , launched a similar cultural revolution-campaign against the Uyghur People in East Turkestan. The Uyghur Human Rights Project has identified at least 386 Uyghur intellectuals detained and disappeared since early 2017, victims of the massive campaign of ethno-religious repression carried out by the Chinese government in the Uyghur homeland. UHRP calls for their immediate release in a new report, Detained and Disappeared: Intellectuals Under Assault in the Uyghur Homeland. It is time to end business as usual. The Chinese government’s systematic persecution of Uyghur producers of knowledge and culture must lead to action by academic, professional, and artistic institutions. UHRP calls on universities worldwide to immediately suspend cooperation with China’s Ministry of Education, including the Confucius Institute Headquarters (Hanban), in light of this documented ethno-religiously based persecution of professors, teachers and researchers. Since early 2017, the Chinese government has conducted a massive policy of indefinite detention without trial, mass internment, and imprisonment of Uyghurs, Kazakhs, and other Turkic Muslims in East Turkestan. As part of this campaign of repression, the Chinese government has committed grave human-rights violations against Uyghur intellectuals, including university lecturers, professionals, teachers, journalists, students, artists, and other prominent individuals in the spheres of education, culture, business, religion and philanthropy. UHRP has released two previous reports documenting the persecution of Uyghur intellectuals. In October 2018, UHRP identified 231 scholars, students, journalists and artists known to have disappeared, been indefinitely detained, received a prison sentence, or to have suffered death in custody. A January 2019 update added 107 known cases, for a total of 338 intellectuals affected by these serious mass atrocities. Today’s report updates the number of known cases with an additional 38 individuals, bringing the total to 386, including 101 students and 285 scholars, artists, and journalists. This group is likely a small fraction of all Uyghur intellectuals suffering serious human rights violations. Of the 386, only four are known to have been released from detention.